The 49th Anniversary of the Tibetan National Uprising. More than 20,000 Tibetans take to the streets. Photos from a Taiwanese blogger in Lhasa on March 14, 2008. Monks of Sera & Ganden Monastery protest. Monks inturupt state media tour in Lhasa. Cell phone photos from Lhasa on March 14, 2008. 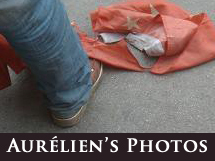 Photos from a French tourist in Lhasa on March 14, 2008.